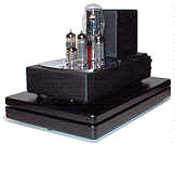 Free of coloration''s, these neutral and effortless sounding triode amplifiers have dynamics and drive that most SET''s sorely lack ~ which is evident by their uncanny ability to drive even 2 ohm speaker loads! Speed, detail/microdynamics, 3D imaging. Approx 3.5watts which is a good thing for some. Approx 3.5 watts which is a bad thing for some. Speakers should be 90db or more depending on room size and how loud you like your music. Caveat, I know Paul the guy with the above review - and listened to these amps for the first time at his house. Paul happens to own the same speakers (thehornshoppe.com Horns) that I do. In a nutshell... I have been at this hobby for 20+ years. This is the first time I have heard TRUE 3 dimentional imagine/sound-stage. Before now, I thought these comments were hype, or imagined. Yes, the speakers have allot to do with it - and I consider the Horns to be a great value - they are simple Fostex 4" full-range, no crossover, backloaded horns for about $700/pair. But these amps are F-A-S-T, detailed, and holographic, if that's not too much of a cliche. I also own the Decware ZTPRE preamp I reviewed here on audioreview, which is a great match. Best sounding amp I've ever owned - so far ;-) FYI, the new Decware Torii amp may be a better match for sub 90db speakers or those with complex crossovers. Kennedy Tube Audio KTA 300B push-pull with JJ/Tesla's, Telefunken input tubes, and Auricap coupling caps. As a low powered SET amp, will likely to clip when asked to drive speakers of efficiency lower than 90 db at high volume levels or speakers with complex crossover networks. This is a follow-up review after over a year of using these monoblocks to drive relatively high efficiency speakers such as the Radials RL-1s and RL-2s, and the Horns from TheHornShoppe. Unlike most SET amps, these SV83Ms prefer lowish impedance speakers. While they don't like such high impedance beasts as the Moth Cicada (12 ohm 94 db), they'll be much happier driving speakers of 8 ohms or lower. I even think they deliver most power transfer into 4 ohm speakers, provided crossover kept to minimum or none and efficiency at least 90 db. I get the most satisfying sound from them driving the Horns with the ZERO Autoformers installed between the amps and speakers, and two REL Storm IIIs. There is a good balance of speed, slam, midrange presence and detail, low bass extension and agility, highs detail and extended as far as the Fostex Fe108 Sigma drivers go. Sources are the Vecteur D-2 transport linked with the EVS Millennium 24/96 DAC II (discontinued). Although tube biasing is done automatically, the amp has a toggle bias switch in front that lets the listener choose between a purer sound with truer tonality signature or a bass boosted more powerful presentation. It's like having two amplifiers for the price of one. Besides, there are two rocket switches in the back for POWER and STANDBY. I always start by switching on the STANDBY while leaving the POWER off. In this mode all tubes get the power but can make no sound, so I can make any cable or interconnect swap while letting the amp warm up (very useful feature if you're to compare, say, two speakers or cables or even sources). These low powered amps have excellent speed and accurate timbral presentation. Their soundstage is deep and wide beyond speakers (and exceeds room dimension sometimes); image specificity and size are pretty good and even better when impedance is matched between amp ans speaker. I'm still exploring these amps. They won't be replaced by any super amps for a long time.